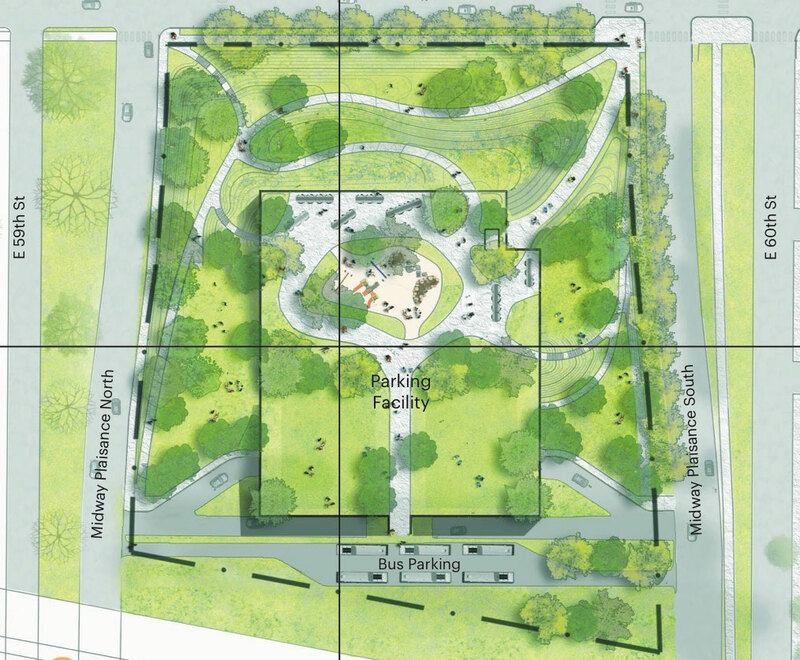 As first reported by the Chicago Sun Times, the Obama Foundation originally announced plans to build a parking garage in the public Midway Plaisance, just west of the proposed Obama Presidential Center designed by New York-based Tod Williams Billie Tsien Architects. The plan to build the 450-car above-ground garage in the Plaisance was met with criticism from multiple community organizations, including in the form of a recent letter to the Foundation from over 100 University of Chicago professors. The new plan calls for the garage to be moved underground, beneath the Presidential Center, in Jackson Park. While this may alleviate some of the resistance to the project, it will still have to contend with a federal review regarding the changes to Jackson Park itself. Both Jackson Park and the Plaisance have been listed on the National Register of Historic Places since 1972. Designed by Frederick Law Olmsted and Calvert Vaux, both the park and the Plaisance were the site of the 1893 Columbian Exposition. The letter also points out that the Presidential Center is not the Presidential Library, which is administered by a federal agency, the National Archives and Records Administration (NARA). The Barack Obama Presidential Library will be the first presidential library to be completely digital. Once all of the documents that are normally stored in a presidential library are digitized, the original copies will be put into a NARA storage facility. Over the past year, a series of community meetings and conversations with local organizations have been held to gauge community sentiment. While the overall mood from the city has been positive, issues like the parking, and the signing over of public land to a private organization have raised red flags with many, and will continue to through what will be the most anticipated and watched project in Chicago.